Ottawa's Tea Party — This is Lex. It’s inconspicuous. It’s innocuous. It’s delightful. Something is brewing within the former 1900s dwelling at 119 York St that piqued our curiosity. With our nose furrowed and ears astute we ventured forth to find out what this self-proclaimed mad hatter is all about. Sarah Boutcher, a Mixologist, has been brewing over 160 varieties at The Tea Party for the past seven years. Some of her elaborate concoctions may be mad, but she isn’t. We were welcomed with the familiarity of an afternoon tea with grandma on a cloudy day in the south of London. It wasn’t so long ago that people called the whimsical red brick building that now expels the aroma of steeped tea and afternoon biscuits their home. “My girlfriend’s family lived here thirty years ago!” a patron noted. “I like the idea that I’m inviting people into my house,” Sarah exclaims. Part of The Tea Party’s appeal is its homey feeling. Mismatched cutlery, dishes, and furniture all contribute to the atmosphere. A far cry from the typical fast paced, silver Macbook lined caffeine guzzling coffee shops we’re accustomed to in Ottawa, The Tea Party makes us forget about electronic devices and faux social media connections. It instills something we so rarely get the opportunity to enjoy, a personable conversation. Everything feels warm and welcoming inside, from the dim incandescent lighting to the charming red brick walls, comfy couches, and worn hardwood floors. All blended perfectly together for a meaningful conversation with an old friend. There’s a tea for that. Can’t sleep? Boutcher says to cozy up with a chamomile and lavender tea. Feeling tense? She recommends a chamomile and spearmint blend to relax. Boutcher even came up with the “Caterpillar’s Cure” tea to cure hangovers with a blend of peppermint for nausea. Ginger, and green tea cleanses with antioxidants. There’s an endless amount of mad concoctions to stock up on for your Sunday morning hangover. 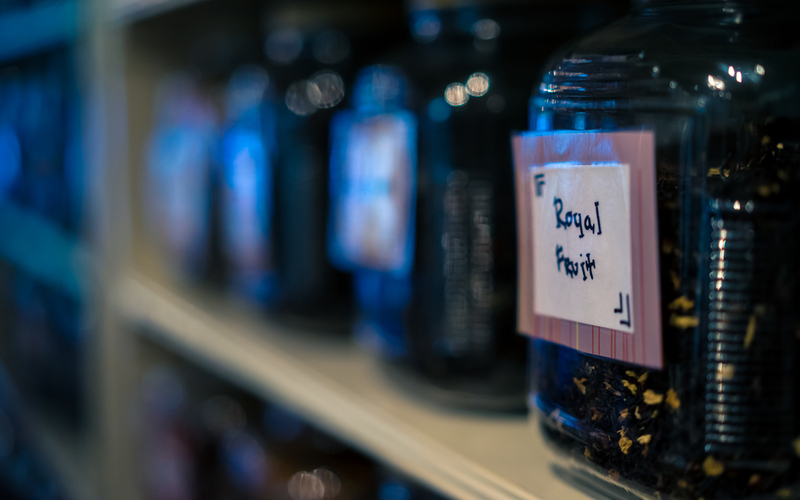 With over 160 teas to choose from it’s hard to find something you won’t like. If a guest walks in claiming to not like tea…“Oh I’m gonna make you like tea!” Boutcher says with a chuckle. Let’s go for high tea. If you’re on a first date and things get awkward, just look down into your cup for a little bit of inspiration. “Ever wondered what the essence of Sherlock Holmes would taste like? What about Irene Adler? The Queen of Hearts?” Just metaphorically compare the tea you’re drinking to your favorite classic Disney movie. Your date will be impressed, because, well… you’re sipping tea, not coffee and tea is for creative intellectuals. The best part of it all? A pot of tea is less than the cost of bus fare. So if it’s a cold, bleak, dreary day and you want to warm your mittens up, The Tea Party is just what the doctor ordered.